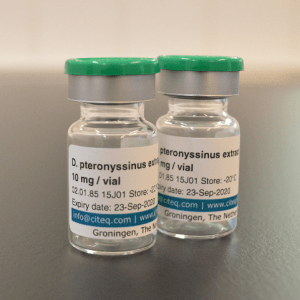 The Der p 1 ELISA kit is used for measuring the major allergen Der p 1. The Dermatophagoides pteronyssinus protein Der p 1 is one of the major house dust mite allergens. 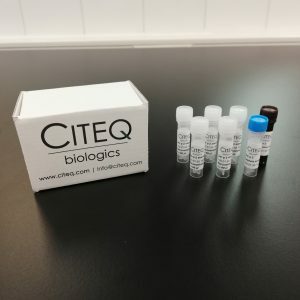 Using this Enzyme-Linked Immunosorbent Assay (ELISA) kit the concentration of this allergen in solution can be determined. This kit provides sufficient antibodies and Der p 1 standard to perform ELISA experiments on five 96-Well plates. The ELISA kit is sufficient for the coating of five 96-Well plates. 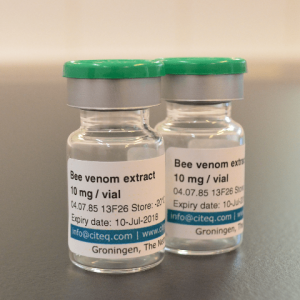 All components of the kit are supplied in freeze-dried (lyophilized) form in 0.5 ml vials. It has a longer shelf life than the regular ELISA kits which will be delivered in liquid form. One of the advantages of our kit is that the Der p 1 standard will be delivered in 5 separate vials, this way you can use 1 vial with the right amount for each plate. Just dissolve the material in your buffer of choice and you are ready to coat the plate. This kit is intended for research use only. Upon arrival the kit should be stored at -20°C in a non-frost free freezer. The kit should not be used beyond its expiry date. Wear disposable (latex) gloves when handling specimens and reagents. Use disposable pipette tips throughout the procedure to avoid contamination of reagents. Every ELISA kit requires a standard which is crucial for its accuracy and being able to compare results to other available ELISA’s. Currently there are no standards available for house dust mite research using major allergens Der p 1, Der p 2, Der f 1, and Der f 2. 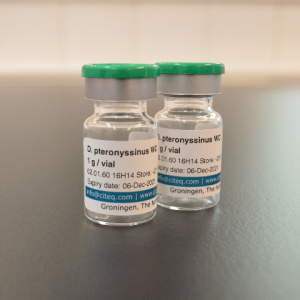 To measure a novel substance with an ELISA assay such as Der p 1 a new standard needs to be developed which is subject to extensive examination as established by the European and international Pharmacopoeias. At the moment there are no international standard references available. When it comes to creating a substance fit to being called a ‘primary standard’ for use in (ELISA) assays several qualifications need to be met according to Chapter 5.12 in the European pharmacopoeia. This is because it needs to be widely acknowledged as having the highest metrological qualities whose value is accepted without reference to other standards of the same quantity. For a Der p 1 standard to be eligible as a primary standard it needs to be characterized by a variety of analytical techniques chosen to demonstrate its suitability for use. Testing the standard is done by verifying two major qualities of the substance, the first being the characterization of the substance and the second being the purity. This needs to be established by appropriate chemical attributes such as the composition and molecular mass. Techniques used may be e.g. NMR, IR or mass spectrometry. Several earlier attempts have been made to try to achieve international standards e.g. in the 1980s with the British standards and in the last decade with the Create project. Citeq has developed standards based on what is currently the state of art e.g. described in Chapter 5.12 in the European pharmacopoeia. By using different physical chemical methods for analysis and a defined international standard method with an international reference as the absolute method. With the help of the Pharmacopoeia it can be concluded that the best set-up for a standard is to have completely defined material, including its mass. From natural source materials the following major allergens are obtained: Der p 1, Der p 2, Der f 1 and Der f 2. The purification is performed using several classical column techniques from defined HDM source materials and defined buffers. Finally the purified proteins are freeze-dried and weighed. The purity of the proteins is demonstrated by SDS PAGE (Coommassie Brilliant Blue and Silver staining). The protein concentration was determined by the Bradford, the BCA assay and OD 280 nm. The amino acid composition was determined by mass spectrometry (LC-MS) and the water content of the freeze dried allergens was determined by the Karl Fisher method. Two of the most important cornerstones of science are reproducibility and replicability. Citeq’s natural Der p 1, Der p 2, Der f 1 and Der f 2 standards have a purity of >98% and have thus been named our golden standard. 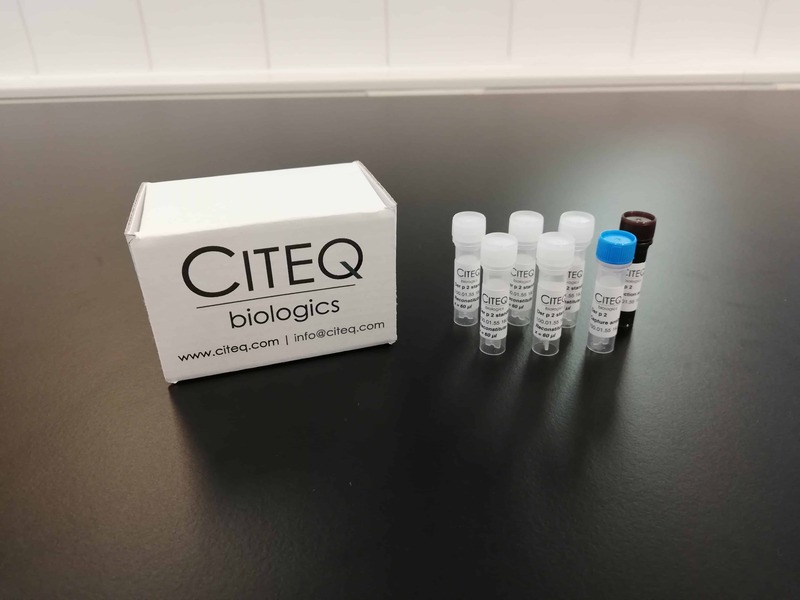 Based on this golden standard, the ELISA standards which can be found in the Citeq’s ELISA kits have been developed. Using these new ELISA kits you will ensure the amount of each protein used in experiments from now on can be determined, allowing for more in depth, reproducible and replicable research. The ELISA coating stabilizer is a ready to use solution for stabilizing ELISA plates after the antibody coating step. The coating stabilizer is easy to apply and will ensure that the plates remain stable for up to 8 months at 2-8 C without significant loss of signal. This will allow you to prepare your ELISA plate in advance while keeping it stable and ready for use at a later moment. One vial of ELISA coating stabilizer contains enough material to stabilize one 96-Wells plate. Included with the stabilizer are plastic sealing films used to seal your plates. These will keep out moisture and prevent contamination for extra stability during storage. 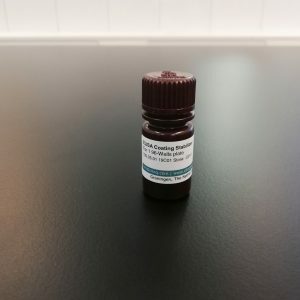 This coating stabilizer is an optional product for our ELISA kits but we highly recommend it when performing ELISA assays. For extended storage of the detection antibodies in our ELISA kits we also recommend the use of our Antibody Reconstitution Buffer. This buffer allows storage of the antibodies at -20°C because it inhibits crystallization of buffer salts. Reconstitution of the freeze dried detection antibodies in our Antibody Reconstitution Buffer will ensure stability for up to 3 months. You can add the product of choice to your quote request. Just click on the“add to quote” button at the top of this page (no registration needed). We will contact you as soon as possible. Off course you can also send us an e-mail or give us a call.